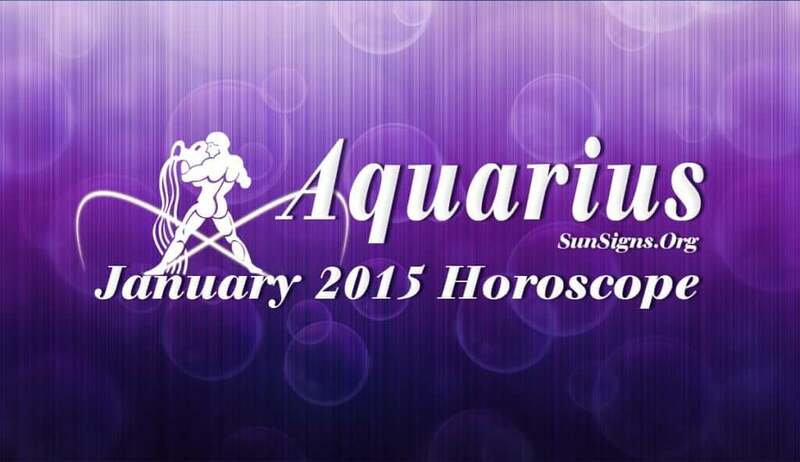 January 2015 Aquarius Horoscope predicts that planetary positions are favorable for rapid growth and achievement. Till the third week of January 2015, there will be a balance between the family and domestic affairs with the affairs of the outside world. After the third week the focus will be more on home and family along with matters of the mind. Your independence and determination will dominate this month and you will get what you want. You must review events of the past and decide on the new objectives to work with. The January 2015 Aquarius career astrology predictions foretell a change in job, which you were hoping for. You should be wary of conflicts with your associates at the work place. This is a good period for people in marketing and creative fields. The monthly Aquarius financial forecasts for 2015 January predict a highly beneficial period. Chances are that you will get money unexpectedly from unknown sources during the third week of the month. Risky investments will be profitable for the Water Bearers. Love for single Aquarians will be serious during the month. Existing relationships need a review and flawed relationships will have to be terminated. Marriage should be avoided during the month. Plans to get pregnant must be postponed for the next month. Family issues will revolve around religious and spiritual issues and welfare of children. Health will be fabulous during the month for Aquarius zodiac sign people. You might resort to a change in your exercise routine.